A nail biting (no it was even finger biting) finish for the first test match where the tail end saved the test match for England from the jaws of defeat. What does that mean to Aussies?They have an upper hand start in the series. English will become under dogs going forward. They used this label very wittily in the second test. A sensational start from Strauss and Cook in the first innings. They posted a neat 425 in their first innings. Australia came in to bat and Anderson to start the damage of getting through the Aussies wood work. Good fielding and support from other bowlers helped England manage to restrict Aussies for 215. Nasty boy Ponting surely did try his tricks by talking about poor umpiring. Day 5: I asked Rohit, "Who are you putting your money on?". No prizes for guessing the answer. Wicket for Clarke almost forfeited the match to England. 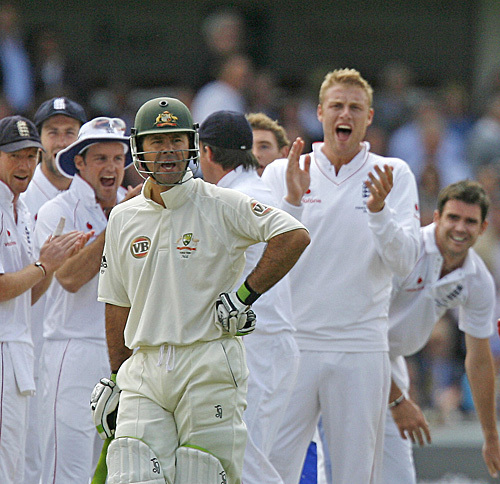 Nothing like winning an Ashes test in Lords. It was like watching the true sprint of the game. This is what I call cricket! Cricket at its best. The fancy 20 over cricket is an over kill and boring on a longer run, since its money driven. Once again Congrats to the English team. We got more work to do, let's avoid another Amazing Adelaide! Like the Ashes, I wish we make Border-Gavaskar trophy more interesting. Oz has not recovered yet from the retirement of McGrath and Warne. Had they been there, England's score will read like 180 all-out. Oh come on Sankar, let me take you to history! Look at this scoreline 2nd test with a formidable bowling attack Oz had. At least McG was injured in that match. How about this scorecard McG, Lee, Warne, Gillespie arguably one of the best. Still Oz limped to a last wicket draw! Lets not throw the ball at umpires when the players play it wrong. Koertzen is a seasoned umpire. All said and done to Err is human. Aussies won hearts by putting up a splendid fight and sportive presentation speech. What a match. England won it convincingly. Very surprising was Pontings presentation ceremony speech. At least they are trying to grow up. Of course, credits to Flintoff and Co's bowling efforts. @DK give a high five for that win.